…also known as a “photofacial” treatment that delivers broadband light through the skin for Skin rejuvenation and illumination. 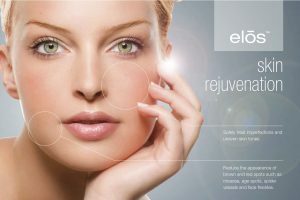 elōs Plus combines Intense Pulsed Light (IPL) with Radio Frequency (RF) which creates more specific heating of targets (chromophores) in the skin. This allows the use of less optical energy, which increases treatment safety in darker skin types. These colored targets on your skin, generally come from various forms of hyper-pigmentation. This can be in the form of sun spots, freckles, birth marks, blood vessels, redness, and/or melasma to name some of the most common. Whereas photo-aging from sun exposure occurs due to the damaging effects of the ultraviolet light, more specifically, the UVA and UVB components of sunlight, the IPL Photofacial treatment uses the higher wavelengths of light, mostly in the visible range, to rejuvenate the skin and counter the effects of photo-aging. IPL broadband light is non-ablative or in other words does not damage the surface of the skin. The light is delivered into deep layers of the skin (dermis) and leaves the top layer of the skin (epidermis) untouched in order to treat specific targets and concerns that appear on skins surface. IPL Photofacial is an ideal treatment for skin care concerns ranging from sun spots and hyper-pigmentation, to Rosacea and broken capillaries. Having regular Photofacials is a great way to keep the skin glowing, fresh, even-toned and beautiful throughout the year. With adequate skin aftercare, the results can last for years. Refrain from any sun exposure 2 weeks prior to your IPL treatment. Refrain from using Retinol/Retin A for 3-5 days before your treatment. No makeup can be worn during the treatment. Your provider will take the time to consult with you about your specific concerns and answer any questions you may have. The treatment time is approximately 30 minutes -1 hour, depending on the area treated. During treatment a stinging sensation can be felt much like a rubber band hitting the skin along with a mild to moderate heat sensation. IPL treatment can cause moderate redness or mild swelling. Refrain from sun exposure and wear the recommended SPF after your treatment. Most patients will see a darkening or crusting called “peppering” 3-5 days after their treatment. Do not pick or scratch these spots! The spots need to fall off on their own and heal naturally. Makeup can be worn to cover any spots or redness that occurs. Normally patients need 3-5 treatments for optimal results.